South Korean consumer electronics giant Samsung has launched its first Android Oreo (Go edition) smartphone. Dubbed Samsung Galaxy J2 Core, the smartphone comes in only one colour — Golden colour and will be available in India and Malaysia starting today. The Galaxy J2 Core is going to be an affordable Android Go phone from Samsung. And while its specs are nothing to get excited about, at least it will come in a variety of lively colors. Samsung Galaxy J2 Core features a 5-inch qHD TFT display with 540×960 pixel resolution. The device is powered by company’s own 1.4GHz quad-core Exynos 7570 processor with Mali-T720 MP1 GPU. The dual-SIM smartphone runs Android 8.1 Oreo (Go edition). The handset offers 1GB of RAM and 8GB internal storage. Users can further expand the storage by adding a microSD card. 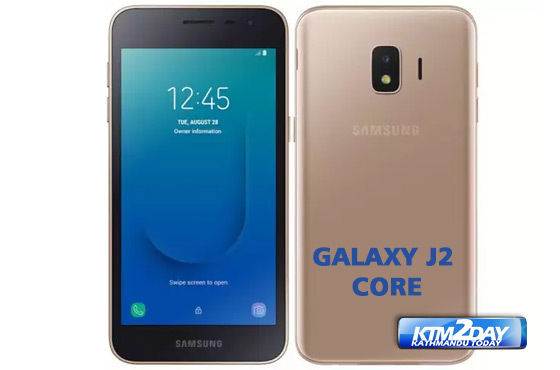 The Samsung Galaxy J2 Core sports an 8MP rear camera with LED flash and f/2.2 aperture. There’s also an 5MP front shooter with f/2.2 aperture for selfies. Measuring 143.4 x 72.1 x 8.9mm, the smartphone is backed by a 2,600 mAh battery. In terms of connectivity, it offers 4G, VoLTE, 3G, Wi-Fi, Bluetooth and GPS. 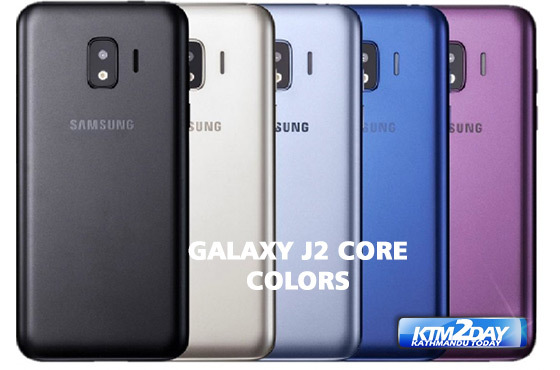 The company has launched the J2 Core in the Nepali market and the price is set at Rs. 11,690. Recently, Samsung launched its flagship device — Galaxy Note 9 in Nepal. The phablet comes with a starting price tag of Rs 109,990 and is available for pre-booking.